Identifying demographic, clinical, and geographical factors that contribute to disparities in the receipt of physician recommended chemotherapy in breast cancer patients. The Texas Cancer Registry was used to identify women aged ≥ 18 years with invasive breast cancer diagnosed from 2007 to 2011 who received a recommendation for chemotherapy. 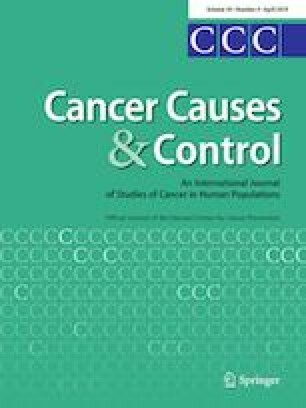 Multivariable logistic regression was performed to determine associations between demographic and clinical factors and the receipt of chemotherapy. Cox proportional regression was used to estimate the hazard ratio (HR) for overall survival. Spatial analysis was conducted using Poisson models for breast cancer mortality and receipt of chemotherapy. Age ≥ 65 years, residence in areas with > 20% poverty index, and early disease stage were associated with lack of receipt of chemotherapy (all p < 0.001). Lack of receipt of chemotherapy was associated with decreased overall survival (HR 1.33, 95% CI 1.12–1.59, p = 0.001). A 38-county cluster in West Texas had lower receipt of chemotherapy (relative risk 0.88, p = 0.02) and increased breast cancer mortality (p = 0.03) compared to the rest of Texas. Older age, increased poverty and rural geographical location are barriers to the receipt of chemotherapy. Interventions that target these barriers may reduce health disparities and improve breast cancer survival. MD Anderson’s Department of Scientific Publications provided editorial assistance.